Do you know there is a town in europe that looks exactly like the scenes from fairy tale town? 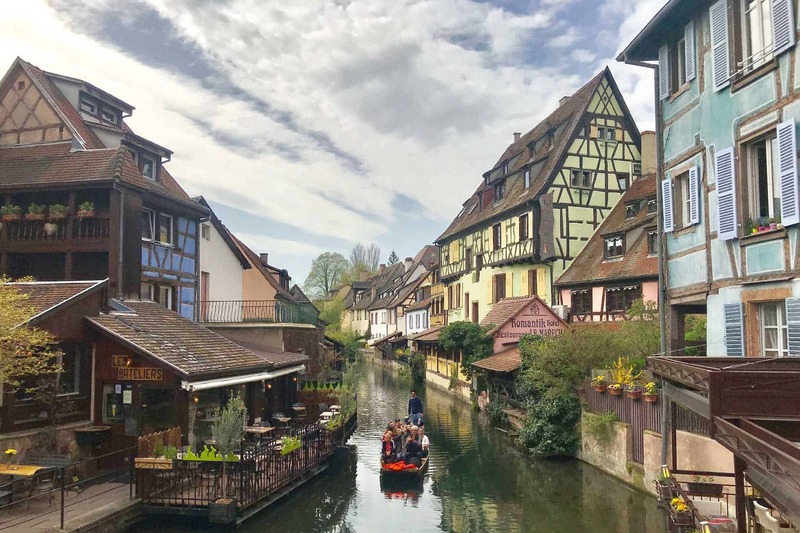 After showing you the bigger town , Strasbourg in Alsace , we are going to show you the nicest and most pretty town in Alsace which is Colmar. 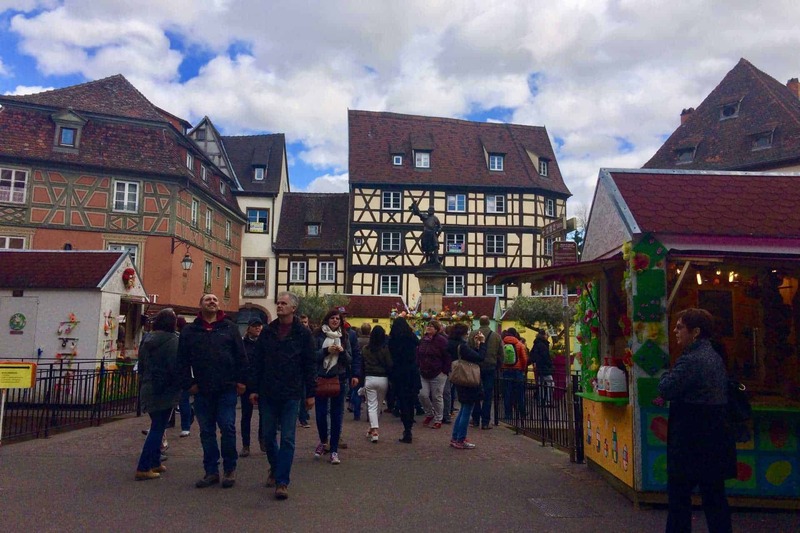 Colmar had the best of both France and Germany culture because of its history. 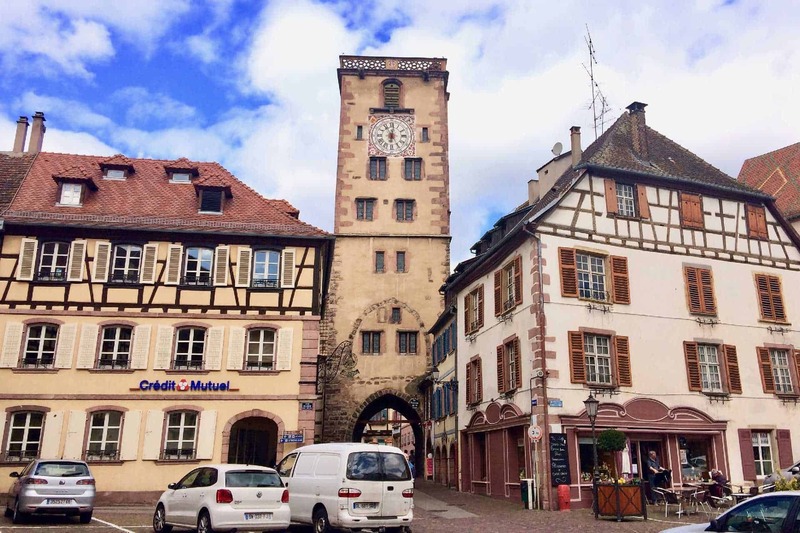 Alsace was French before, then in 1871, the Germans got it back and then during World War 1, the region was returned to France and since then this region is French. 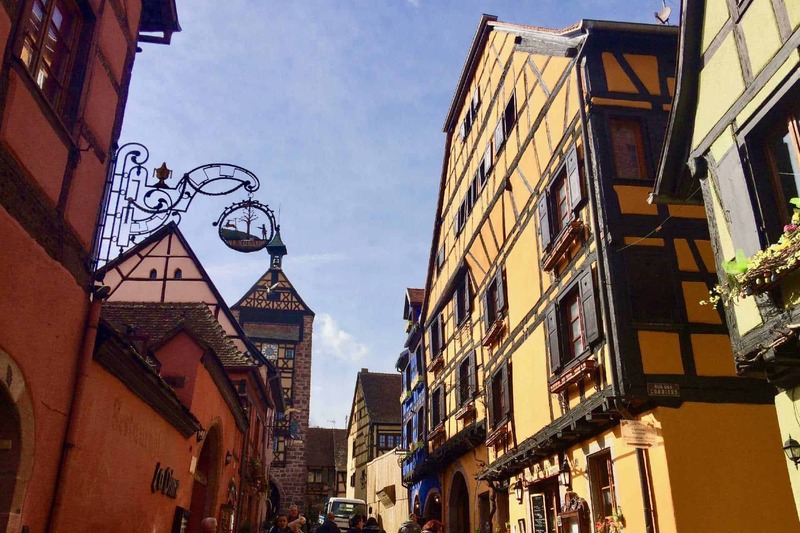 This town is so special that during world war 2, the British and American military were careful not to bomb this colourful little fairytale town filled with half timbered house! Whereas the big sister Strasbourg, was being bombed flat. 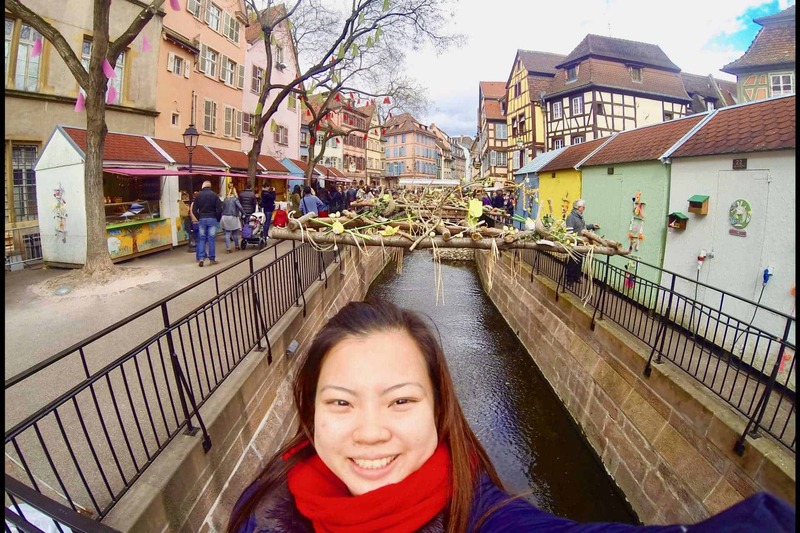 Colmar is a town in the Alsace region of northeastern France, near the border with Germany. The city is on the Alsace Wine Route. 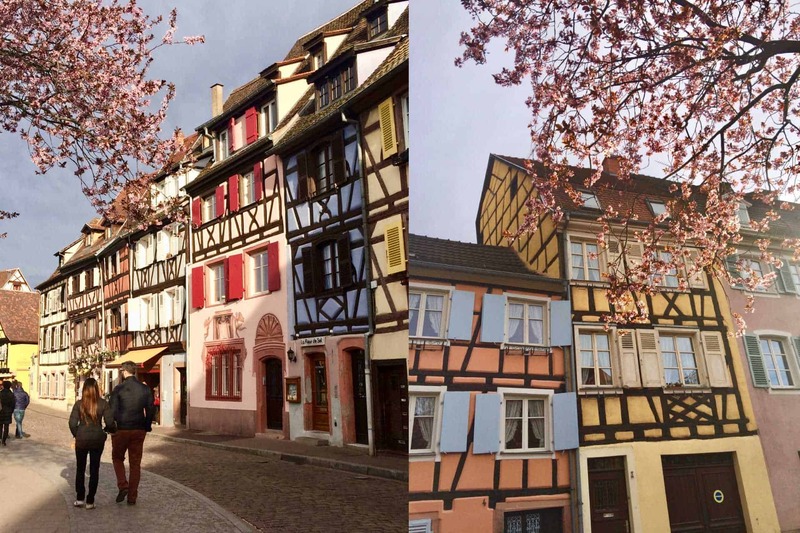 It’s a 6-hour drive from Paris and 1.5 hour from Strasbourg. 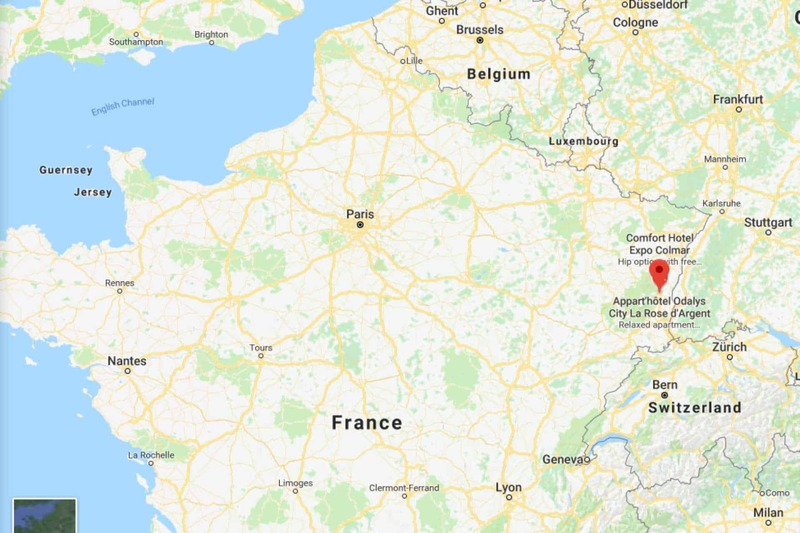 Below is the picture to show you the geographic location of Colmar. It is also famous because of it being the birthplace of French sculptor Frédéric Auguste Bartholdi who designed the Statue of Liberty. 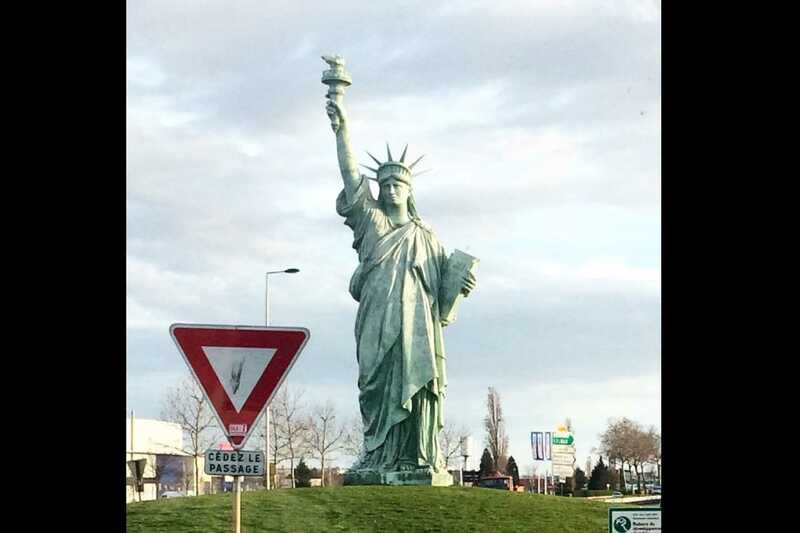 The statue shown below could be seen when you are entering Colmar at a round about to welcome you to Bartholdi’s hometown. 12-meter high replica of the Statue of Liberty. It was sculpted to commemorate the 100th death anniversary of the sculptor Auguste Batholdi, who was born in Colmar and created the “Liberty lightening the world”. Took this photo on a bus ride coming into Colmar. When i was there during a part of my 45 days europe backpack, it’s nearing Easter Day! The town is filled with colourful decorations and Easter Markets. 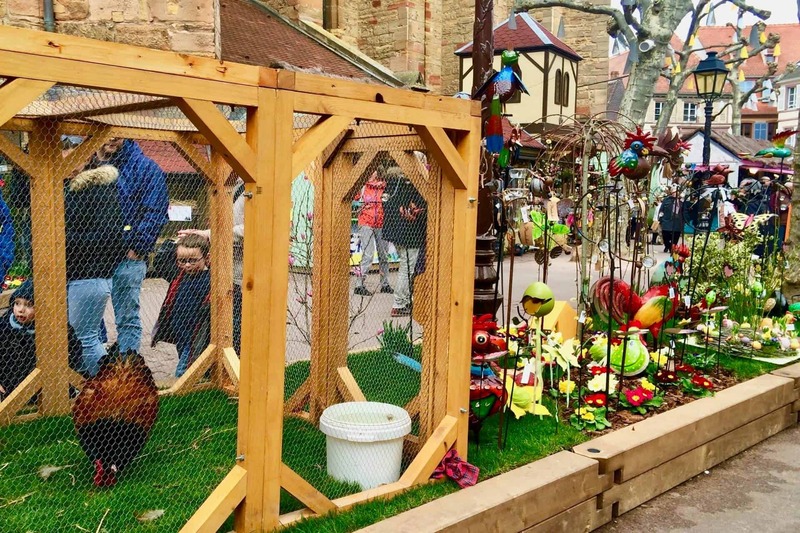 If you are like me who love to visit local outdoor markets, there are two main places for Easter market in Colmar which is around Dominican church and at Koïfhus, Place de l’Ancienne Douane, Colmar, France. Dominican Church Easter Market decorations! 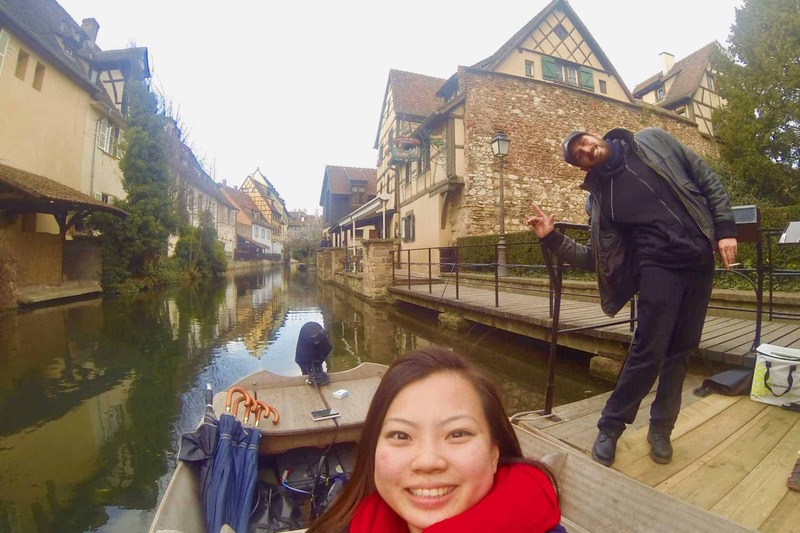 Things that you can do in Colmar! Visit Petite Venise, the prettiest place in town. 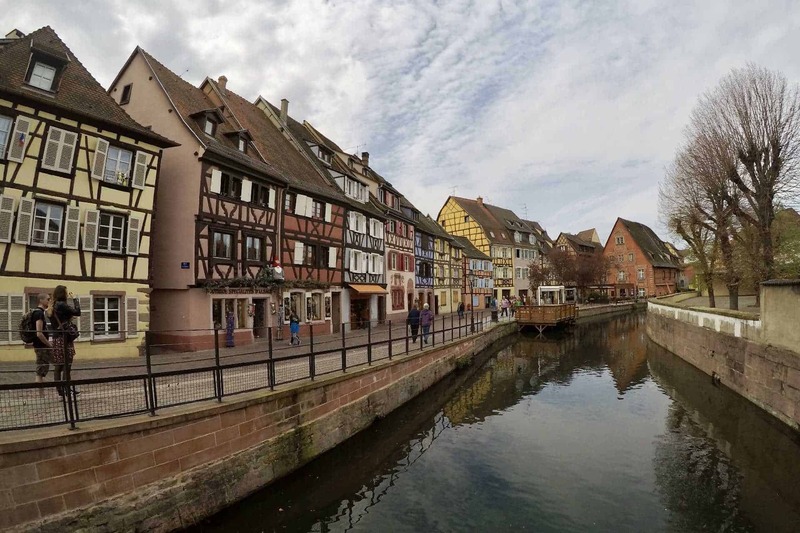 Petite Venise was a place for millers, fishermans and tanners built near the canal for the water source and a place for farmers to bring their goods in to the covered market hall at colmar to sell off the goods. The house are in colours for a reason, for eg. blue for fishermans, yellow for bakers, green for farmers, white or tan for tanners. Houses of the rich were made from stones,while budget builders made half timbered structures to save cost. Rich or poor,all houses sat on stone base to prevent them from sinking into marshy ground and to preserve the ground floor if there is any fire. Look closely to the windowsills and you will know who are the rich ones and who aren’t ( clue: stone sills means whole building made of stone and vice versa for wood). Petite Venise on pont du Fanny,this is also where the farmers will come into the town in the boat’s direction. 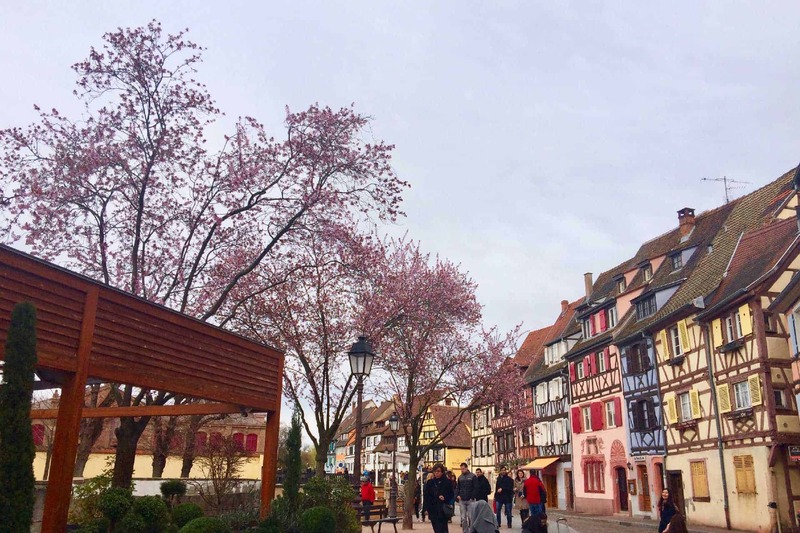 Cherry blossoms near Easter day in Petite Venise Colmar.I went during end march and its the season of cherry blossoms! Go on a sunset evening boat ride along Petite Venise. 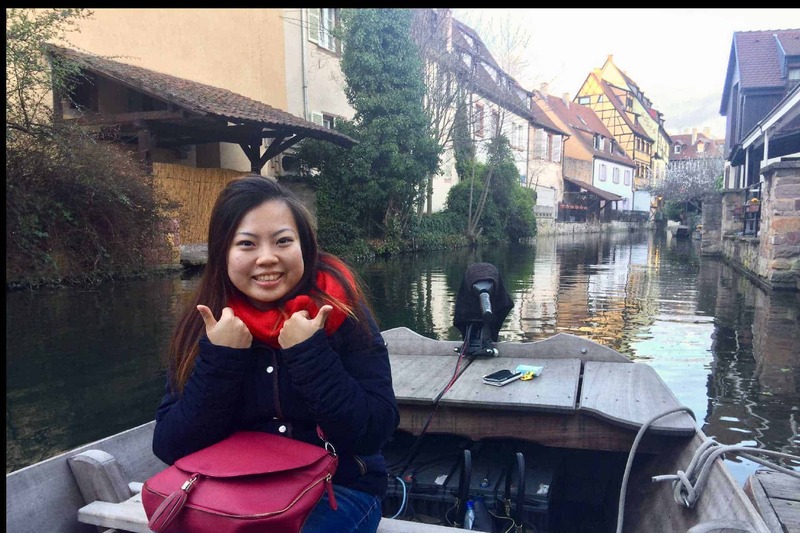 The most beautiful time to take the canal cruise is very important, take the canal cruise during sunset time( google sunset time before heading to the pier).There are two operators for little flat bottomed boats along the canal. 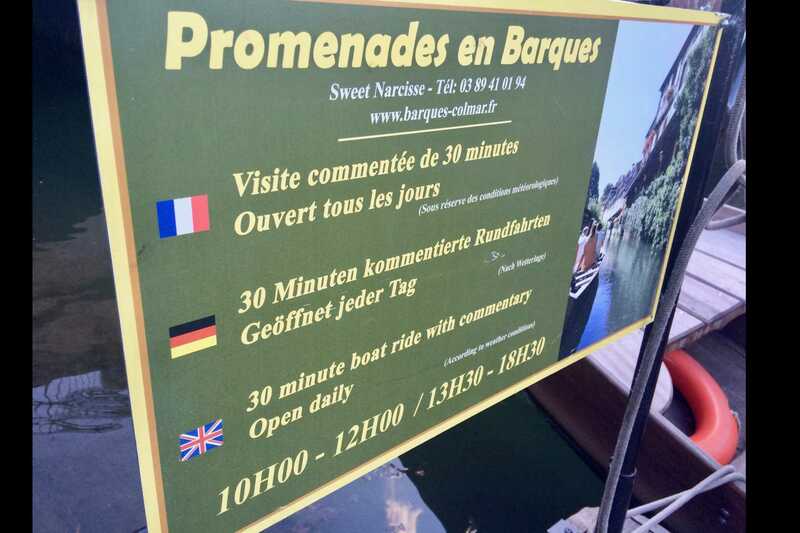 Do not take the boats that depart from the rue de Turenne that i had seen water going into the boat(because the boat is smaller and the operators are not friendly at all). Walk further towards the boat that depart from St Pierre and they offer bigger boats and better tour with someone guiding you in English. The canal cruise cost around 6 euro for 30mins with english explanation and the boss are very friendly. Do not miss the heart shapes on the windows when you are gliding along the canals as they carried stories from the past. The best experience and best explanations, departures every 10 min,daily open from 10am-12pm and 1.30pm to 630pm. Canal cruise with fun boss! The guide told me long time ago, if you see heart shape on window, it means that someone in the house is single and looking for love. If you see diamond shapes, it means they are married and looking forward to have children. For now, the heart shape is for protection and decorations. 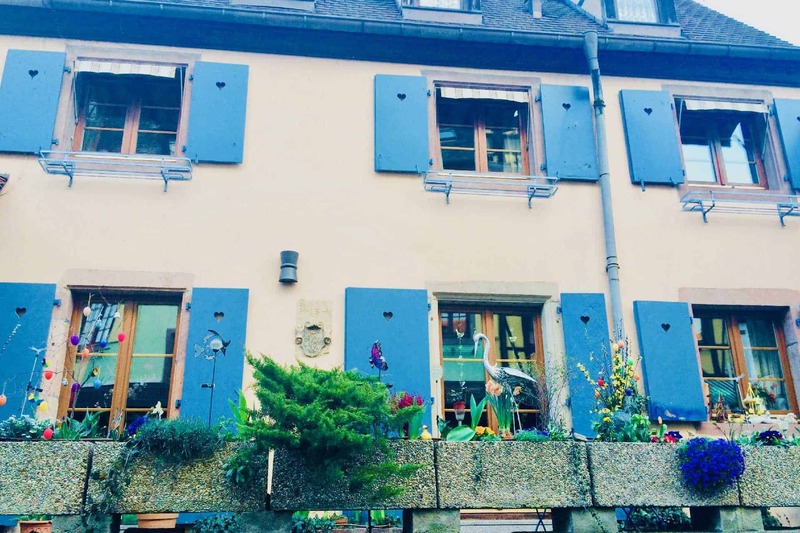 Visit the smallest house in Colmar. 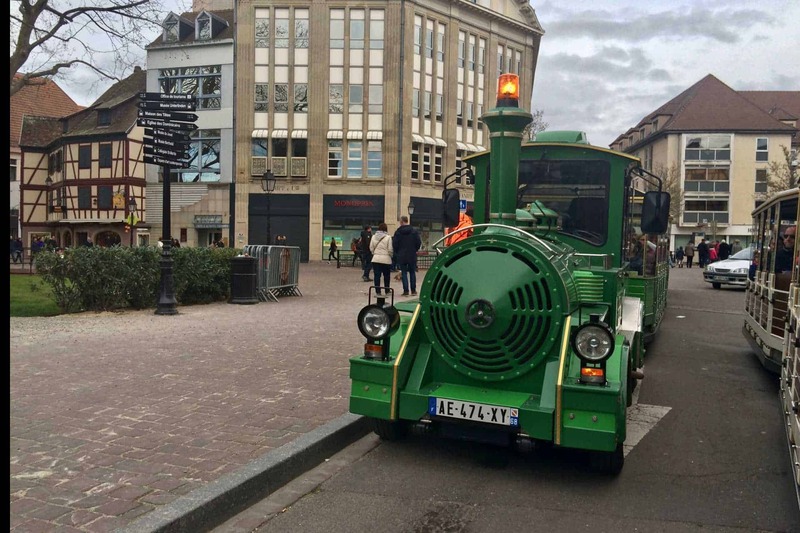 Take a touristic mini train to have a quick look of Colmar. 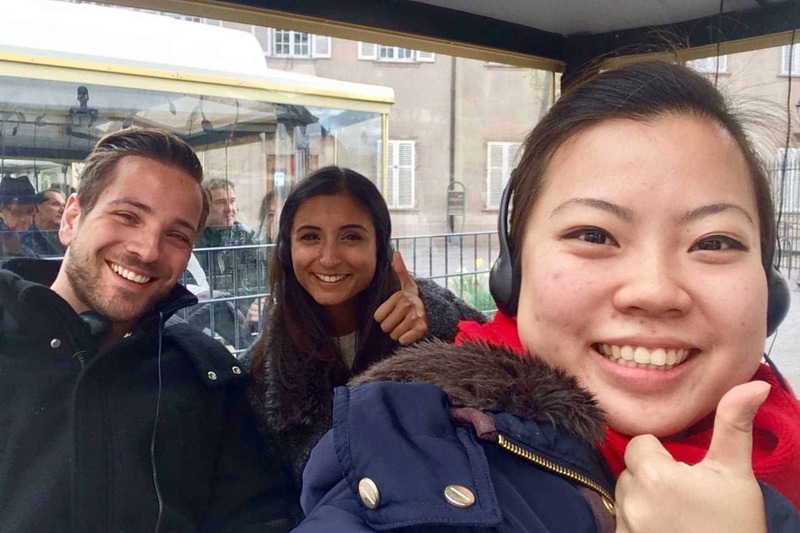 Make new friends on touristic mini train ride around town! Sitting in the white mini train as i passed by the green mini train.The train ride is 40mins and cost around 7 euro. Visit Maison Pfister and say Hi to Mr Martin & Mrs Martine Storks high above St Martin Church. 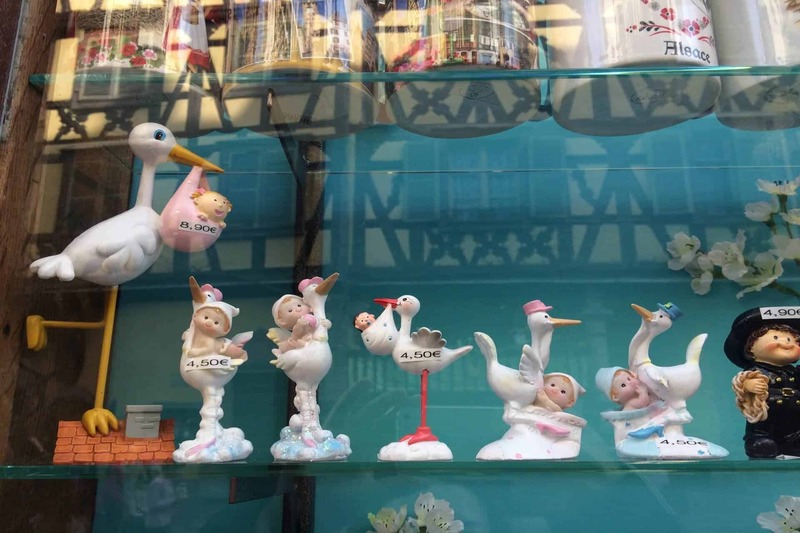 As mentioned in previous Strasbourg post, that storks are lucky animals in Alsace that represent fertility. The children in Alsace are taught from young that its the storks that sent them to their mummy and daddy. 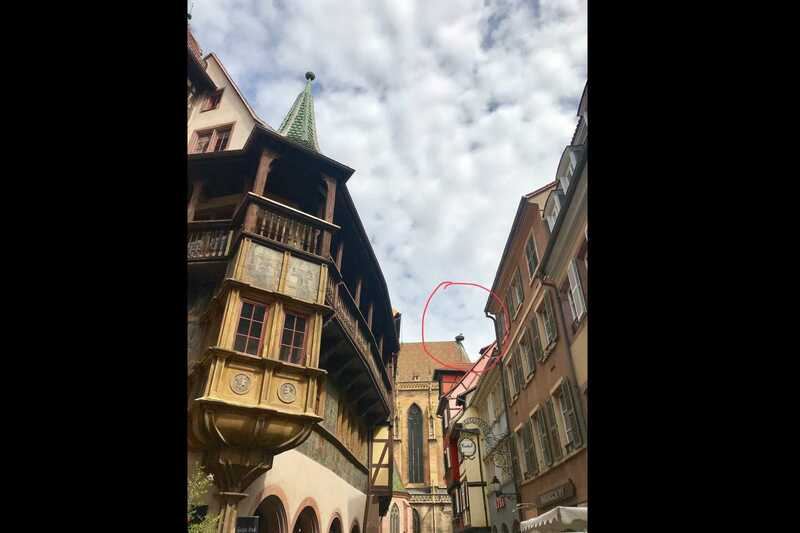 A stork nest can weight up to 500kg and thats why if you look closer the citizen of colmar put a protection around the stork couple’s nest above St Martin. It’s also said that if a stork chose your house to build a nest means that it will bring you luck. If Mr Martin stork and wife is not at home, you can get souvenirs back home from town to bring home some luck. Try Alsatians dessert from local bakery. 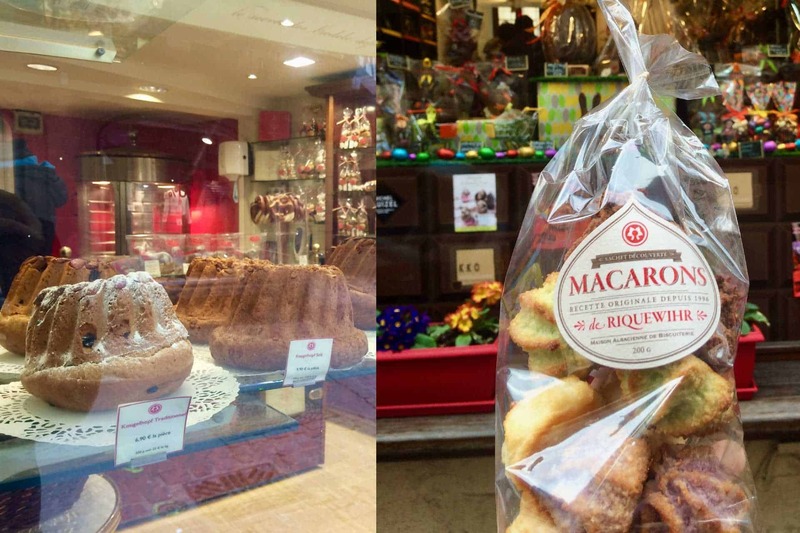 Visit the most famous bakery of Colmar at the bakers Street at Maison Alsacienne de biscuiterie thats sells both famous alsatian dessert of Kugelhopf and local macarons (like marzipan made up of coconut and almond). Kugelhopf glace(on the right,it’s a light cake mixed with raisins,almonds,dried fruit and cherry liqueur), Marzipan(on the left) – made up of coconut and almond. 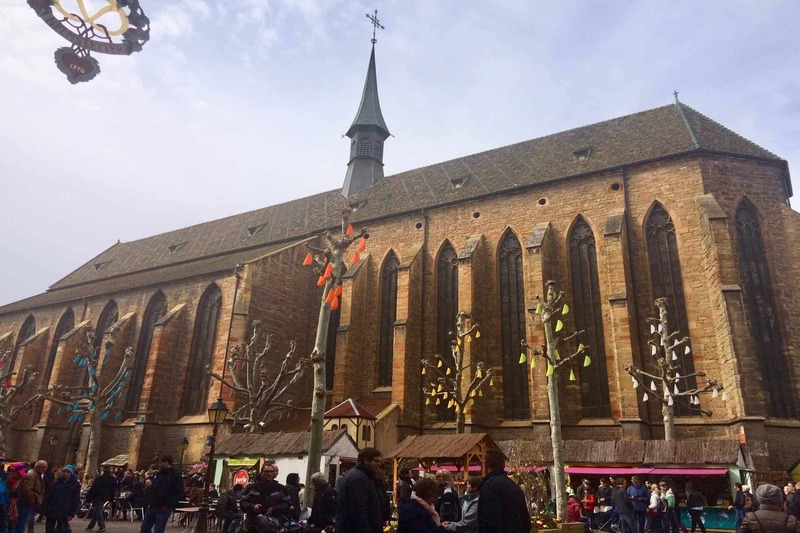 Take a public bus from Colmar’s Station to visit small town along the wine route. 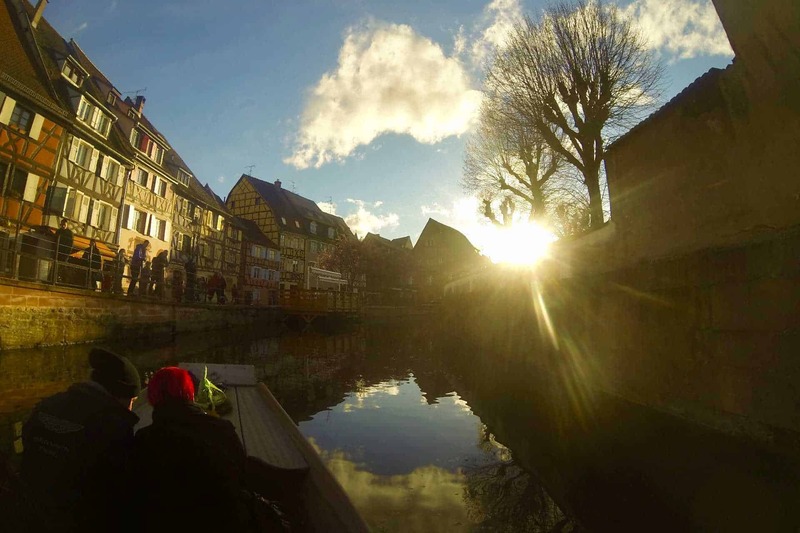 Base yourself at Colmar and take day trips out to visit small towns along the wine route. 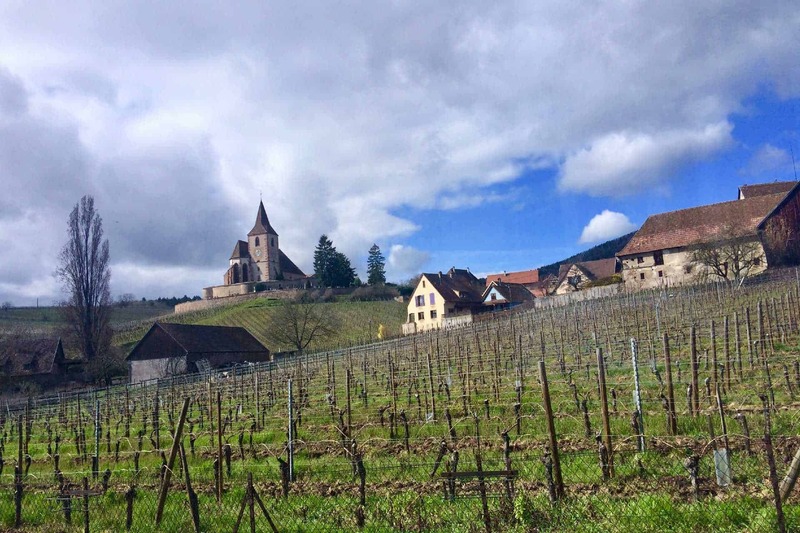 Alsace’s wine route that spans 144km is the smallest wine region in France. 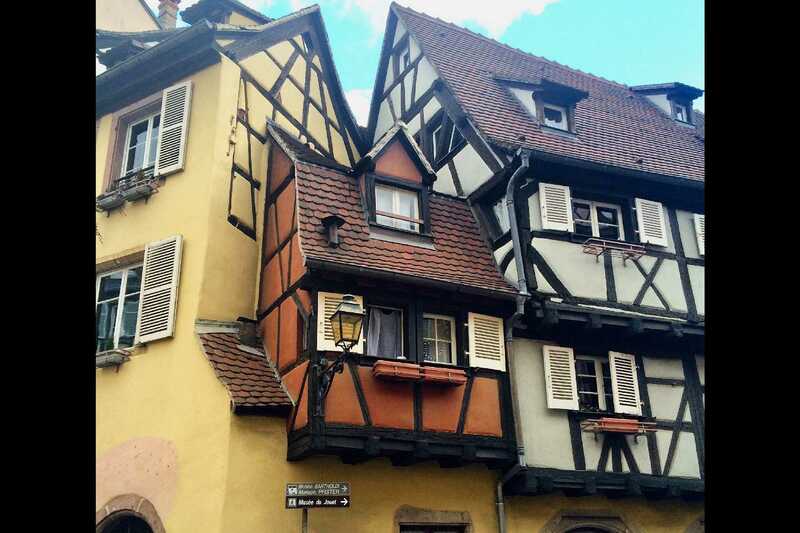 I took the bus 106 to stop at Riquewihr,hunawihr and ribeaville thats takes 30-45mins from colmar. I love the small towns as its more quiet and its similarly colourful! Riquewihr(also known as Rique farm) town, very colourful and quiet town. Last but not least, you are in one of the best wine region in france,do not forget to try the famous Alsatian wine! 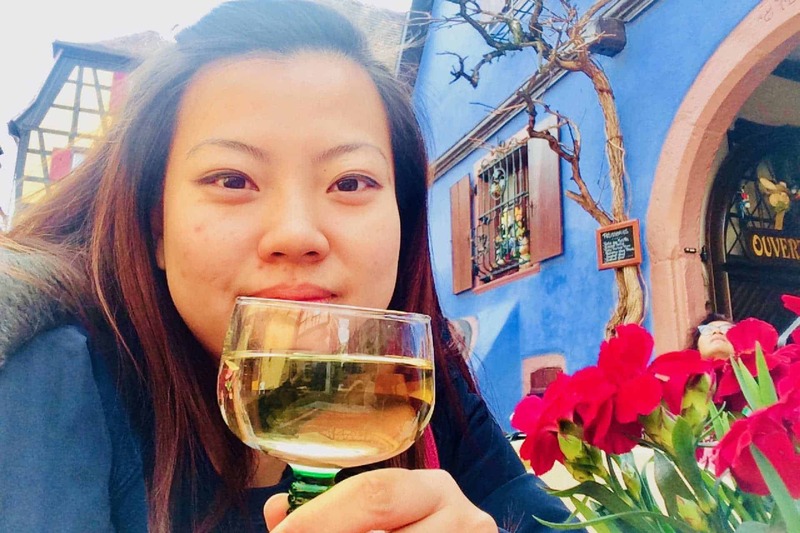 My favourite Alsatian wine is Gewurztraminer as i love sweet wine.The most famouse Alsatian wine is Riesling. Try the Alsatian’s Champange that is called Cremant d’Alsace. You’ll also see eaux-de-vie,powerful fruit flavoured brandies – try the framboise flavor! Pair any of the Alsatian wine with the region’s famous Foie Gras for a perfect afternoon/evening! 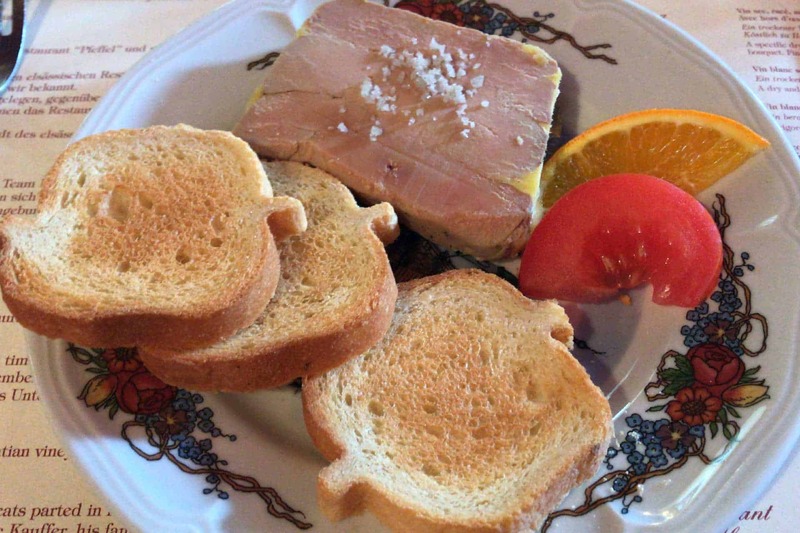 Alsatian Most famous dish Foie Gras – Must Try! Cheers to Good Health and Wealth! Thank you for all the readers, that had been supporting us from all over the world! If you think our blog adds value to you,spread the words, ask your friends to subscribe to our blog and our facebook and instagrams! ← How to make your very own Spanish Sangria at home!